Growing Minds and Mills River Elementary head to McConnell Farm! 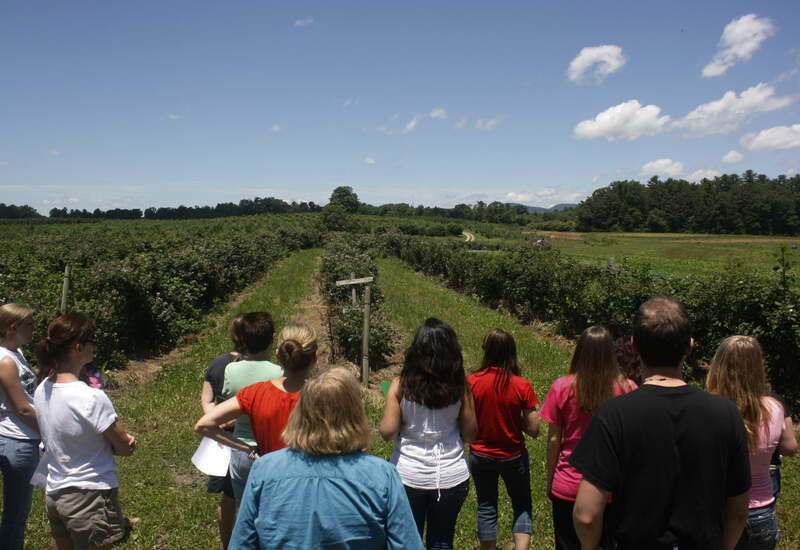 Growing up in a big city in Kentucky, and spending most of my time on a small campus in rural Indiana, the idea of Farm to School was always rather foreign to me. Though I was lucky enough to grow up in a household that believed very strongly in supporting local agriculture, many of my friends and extended family were surprised when I told them I would be spending my summer exploring local food. Just a little background on me: I’m a rising senior communication major at Hanover College in Hanover, Indiana. This summer, I will be working in photography and video with ASAP to capture all the summer local food goings-on! In the Midwest, farming is a big deal, but the production and distribution of the food sometimes goes completely unacknowledged. So, when the Growing Minds team asked me to come along and photograph their tour of McConnell Farms in early June, I was quick to agree. The purpose of the tour was to kick off the recent partnership between Mills River Elementary and ASAP, which is happening thanks to funding from the U.S. Department of Agriculture. More than 50 teachers (including Head Start! ), administrators, and cafeteria staff got to see first-hand where their food comes from and were inspired with fun activities and field trips they could implement in the classroom. Not only did the group get to enjoy a delicious (and local, of course) lunch provided by Laurey’s, which included the best kale salad I have ever eaten, they also got a guided tour of McConnell Farms by owner/operator Danny McConnell himself + enjoyed a strawberry salsa cooking demo led by ASAP. Throughout the day, I enjoyed documenting and observing as these educators caught the bug for local food. 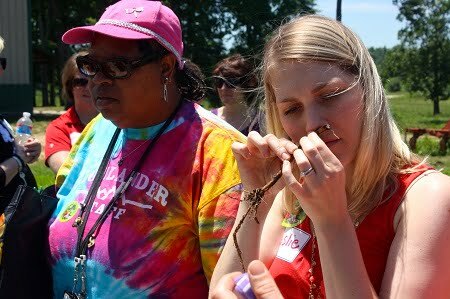 As Danny McConnell showed the group a variety of easy-to-grow vegetables and herbs, the teachers asked questions about accessibility, upkeep, and yield. Some group members were quick to ask about scheduling farm field trips with their class to McConnell Farms, and they even purchased hanging tomato plants to begin their classroom garden programs. 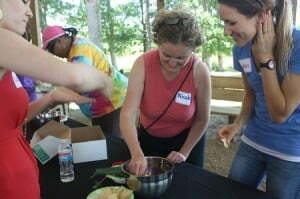 For many of the guests, this was their first time to a farm, first time making strawberry salsa, and first time learning about our Growing Minds Farm to School work. Despite slight initial hesitation from some, the group left the day in high spirits and motivated to implement change within their classrooms. 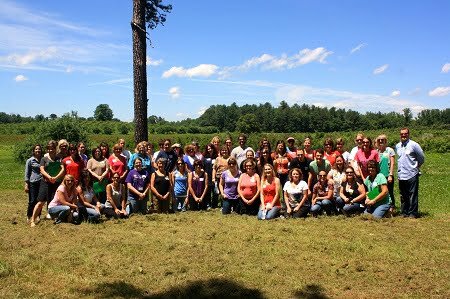 Overall, the farm tour was a great success for Mills River Elementary, Head Start, child nutrition, and ASAP staff. In August, ASAP will host a training at Mills River Elementary, filled with more opportunities to integrate Farm to School into their curriculum. In addition, Henderson County Child Nutrition Director Christina Dodd will continue buying local foods to be served in Mills River’s cafeteria and cafeterias throughout the county. Local products served will be highlighted through taste tests and school cafeteria promotions as a way of showing the students where the foods they are eating come from. ASAP and Growing Minds continue to work with Child Nutrition Directors across the region to source and promote local produce. I’m so excited to spend the summer photographing more of ASAP’s awesome events and area farmers markets! If you see me behind my camera at a tailgate or event, say hi! 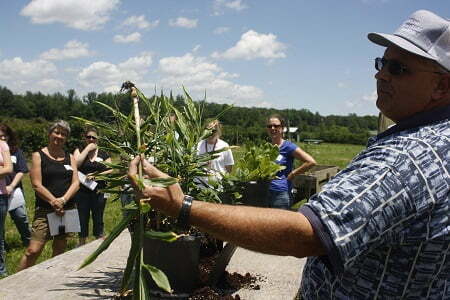 This project has been funded with Federal funds from the U.S. Department of Agriculture. The contents of this publication do not necessarily reflect the view or policies of the U.S. Department of Agriculture, nor does mention of trade names, commercial products, or organizations imply endorsement by the U.S. Government.